Living in a fast-paced world that has witnessed an unprecedented influx of digitalization, we hardly seem to have time to sit back, appreciate and realize how much we need and cherish one another. As an antidote to that, one of our practices at the Collegium is to celebrate each person’s birthday. This week we celebrated Cathryn’s birthday. She has been working with us through the work readiness program at the Collegium Café. She has endured a life that has left her feeling lonely and neglected. To her credit though she has made significant progress in the last two months she has been with us. Her birthday yesterday was a wonderful opportunity to help her feel happy and loved. Her colleagues spoke highly about her and as they appreciated the gifts she brings to the Collegium. Cathryn’s response was even more satisfying to the ears. She said that since she has been working at the Collegium, she has learned the importance of teamwork and more importantly has learned how teams help us to become successful. She is beginning to feel more connected to others. She is feeling better about herself each day, and wishes to continue to do the good work she has been doing. 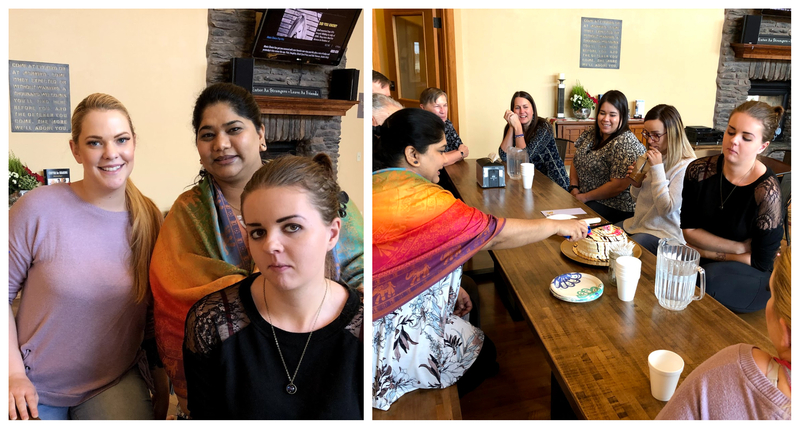 The Center for Sharing has long practiced this wonderful tradition to celebrate birthdays over a simple cake cutting ceremony. Whilst it looks simple the actual exercise of taking turns to speak about the Birthday recipient is extremely rewarding. I believe that it stimulates a sense of oneness in our diversity. This increases our respect for each other. We wish Cathryn a very happy birthday and pray that this is the best year yet, of her life!